As the year winds down, it’s only fitting that we look back at the glorious year of 2008, so I’ve compiled a fun 2008 workout playlist. If you’ve been living under any rocks or haven’t turned on a radio on in the past year, these are the songs you’re guaranteed to have missed. And yes, I know, I probably missed your very favorite, but cut us a little slack—unless you want to work out for like 5 hours straight. This workout is just more than 41 minutes and can accompany any cardio workout. (4:03) I’m Yours, Jason Mraz: A sweet, lighthearted song with a beachy feel that makes me happy each time I hear it. Take advantage of the slower tempo and start slow to warm up the bod. (4:01) Viva la Vida, Coldplay: Pick up your pace to switch from a mild warm-up to a more moderate effort. Keep it up the whole song, and you too will rule the world. (3:00) I Kissed a Girl, Katy Perry: I kinda hate this song, but I do admit it’s catchy and is a great workout song. Kick it up a notch during each chorus to get in several good intervals. (3:23) Paper Planes, M.I.A: Nothing like gunshots in a song to keep you speeding along during your cardio. Also a good song for a strength workout. (3:44) Womanizer, Britney Spears: We’ve reviewed Britney twice this year, so of course we’re not leaving her off the year-end list. The quick pace and sass of this track are guaranteed to increase your pace. (4:04) 4 Minutes, Madonna (featuring Justin Timberlake): Nothing like this pair to get you back into a high-speed interval. Are you ready to go? No hesitating here: Speed it up during the chorus to save the world. (3:22) Pocketful of Sunshine, Natasha Bedingfield: Keep your intervals going here. As the chorus speeds up, increase your intensity. (4:22) Bleeding Love, Leona Lewis: While technically a 2007 release, this song was everywhere in 2008. A steady paced song, slow it back down to a moderate intensity to match it. (3:58) Disturbia, Rihanna: Throw in a couple of 30-second sprints followed by minute-long recoveries, slowing back down to a moderate pace by the end of the song. (3:13) Single Ladies (Put a Ring on It), Beyoncé:Let this crazy-catchy tune carry you through the end of the hard part. Check out the video if you want to be jealous of her dance skills. (4:07) No One, Alicia Keys: Another 2007 hit, but she won a 2008 Grammy for it, and I love this one. Slow your pace down until you’re at a slow walk to recover. Everything’s gonna be alright! 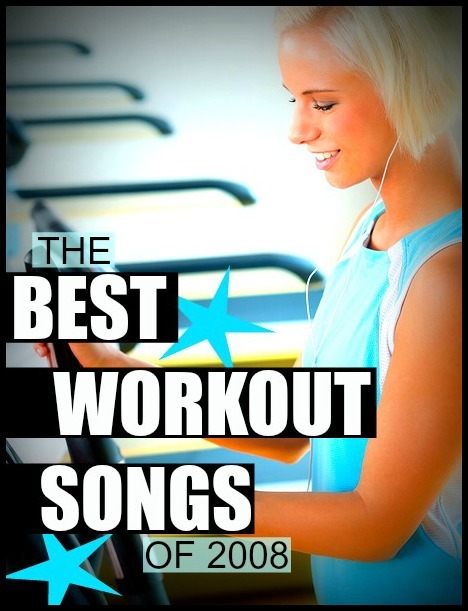 Very nice list, though I am not sure they would find themselves on my personal workout list (I am going to think about my 2008 list and I will get back to you), these are all very catchy songs that do kinda make me want to move around!! I think I could listen to Beyonce’s Single Ladies song over and over again through my workout. LOVE it. BTW — I’ve got a give-away (finally) on my blog that you two ladies should check out!